#Breckenridge Summer Fun Has Begun! 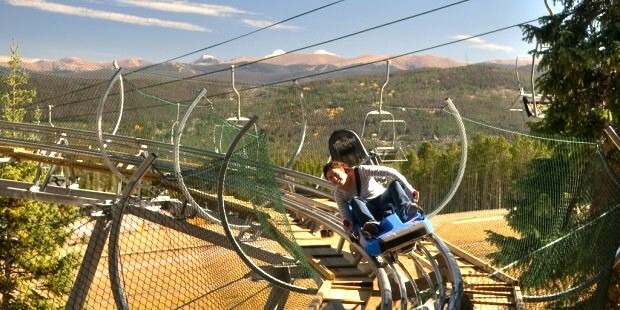 Breckenridge Fun Park and Gondola Open June 15! High above the Cucumber Gulf Preserve, a free summer gondola ride not only offers breathtaking views of both the town and the majestic Rocky Mountains, but it is also a thrilling opportunity to spot wildlife that the average tourist will never see. And as if that is not enough, the gondola deposits the adventuresome at the base of Peak 8, the home of the Breckenridge Fun Park! Featuring the Gold Runner Coaster, a thrilling gravity propelled cart attached to roller coaster tracking, hurtles the rider through twists and turns, offering all of the thrills of an alpine slide. There is plenty of fun for all, including a bounce house, bungee trampoline, mini golf, and more, all in the bright sunlight and gentle summer breezes of Breckenridge. Other great summer adventures include guided hiking or 4×4 tours showcase the natural wonders of the mountains. Mountain biking is another favorite, and guided mountain bike clinics offer a very unique perspective of the mountain trails while on wheels instead of skis or boards. There are so many ways to make memories that will last a lifetime in Breckenridge, truly a four season paradise! There are just a few luxury condos left for fractional real estate purchase at Grand Lodge on Peak 7, and when they are gone, they are gone. If you have been looking, you really do need to move from looking to action right NOW. Luxury fractional real estate has so many benefits – all of the amenities with none of the hassle, deeded property (different from the time share model), and of course the benefit of a far lower price than purchasing a single owner vacation home in Breckenridge or the surrounding Summit County. For information and a no hassle, no obligation consultation, contact Brent Henry, Senior Broker at Grand Lodge on Peak 7 at 970-485-2117. He will help you find the perfect home away from home for you. Or, fill out the convenient form below and he will get right back with you. There is no better fractional real estate opportunity out there in all of Summit County, just ask the owners at Grand Lodge on Peak 7! This entry was posted on May 18, 2014 by elevatemarketingaz. It was filed under Grand Lodge on Peak 7 Breckenridge, Colorado, Luxury Fractional Real Estate Breckenridge CO, Luxury Fractional Real Estate Breckenridge Colorado, Uncategorized and was tagged with #FamilyFun, Breckenridge Colorado, Breckenridge luxury condo sales, Brent Henry Breckenridge real estate broker, Grand Lodge on Peak 7.